Just because Piper's birthday is on Valentine's Day does not mean she's a romantic. 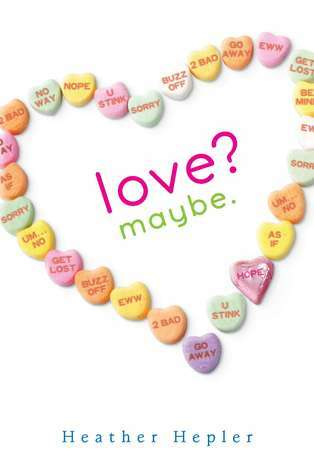 In fact, after watching her father and then her stepfather leave, she's pretty sure she doesn't believe in love at all. Then her friends concoct a plan to find them all Valentine's dates, and somehow Piper finds herself with the most popular guy in school. But true love never follows a plan, and a string of heartfelt gifts from a secret admirer has Piper wondering if she might be with the wrong guy. In this heartwarming romance, true love is more than a maybe - and it might be closer than you think. Candy, cute neighbor boys, Valentine's Day, crazy best friends and secret admirer's! This book has it all. I actually really liked that the main character, Piper, was really cynical about love. I'm not saying it's good for such a young person to have such a jaded view, but it definitely added something different to the story. It also meant there was more to the story and I couldn't wait to find out why she was so down on love. Despite her hate relationship with love, I thought Piper was an excellent character. Her mom was crazy, busy with her flower shop and it often fell on Piper to take care of her little brother and sister. The kids were way more than a handful, but it was so clear how much she loved her siblings and would do anything to help out no matter how much trouble they caused. The book also spends a lot of time in the candy shop she works at, and who doesn't love candy? Her boss, Jan, was so much fun. He dispensed fatherly advice as much as he dispensed crazy truffles (kalamata caramel, anyone?). Quite a bit of the story actually takes place in his candy shop, Piper and her best friends helped him out on a regular basis. I was a fan of both of her besties. Claire was on the more sensible side and knew Piper so well. She'd suffered recent heartbreak, but she wouldn't give up on love. She was almost the anti-Piper. Jillian was the newest to their little group. She was the loud, zany friend who's always got a plan. And her plan was for them all to have love by Valentine's Day. Unforunately, you can't really plan to fall in love. Then there was Charlie, he and Piper have been neighbors and best friends forever. They frequent the roof outside Piper's bedroom for late night chats, which I loved, and he was also excellent with her younger siblings. Even though Piper is sort of dating the popular boy, Charlie is the kind of character that makes you want to shout at her and asking her why she doesn't realize how special he is. This looks like a fun one. Sounds? Never know what makes the most sense there... anyway, thanks for the review!